As a new motorcycle rider, sooner or later you’ll need to replace your old and worn tyres for some nice and shiny new ones (well, maybe not so shiny). The next stage is identifying the correct tyres for your motorcycle. This is the right size and the correct speed and load ratings for your motorcycle. The various markings and numbers located on your motorcycle tyre sidewall can be confusing. Read this guide for understanding those number markings and how to reference those numbers with the speed index rating table and load (weight) index table provided. 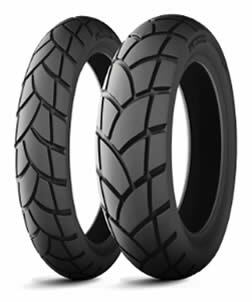 Motorcycle tyres come in different forms and vary depending on riding style, weather conditions and type of surface you’ll be riding on. Be cautious in choosing your tyre – the incorrect choice may impact safety. Read what the main characteristics of each tyre type are below. The main point to take on board is that there’s no single tyre that can perform all tasks to a high standard. Road tyres, also called touring tyres are usually the type of tyres that come as standard on road bikes. Road tyres have a good amount of tread and utilise patterns in the tread to effectively disperse water in wet conditions. They are a good all-rounder which ensures good levels of grip in wet and dry conditions. Road tyres also have low operating temperatures which is important as all tyres perform best at peak operating temperatures. Road tyres are designed to perform best in varied road / weather conditions and are not suited for anything other than the highway. If like most, you ride your motorcycle on roads, but dabble in some off-roading too, a mixed-use tyre is best suited. Tread pattern is where mixed-use tyres mainly differ. The wider treads provide improved traction on loose surfaces, but at the sacrifice of having less road contact than dedicated road tyres. In order to stick to the road better, soft rubber along with the maximum road-to-rubber contact is essential. Sports tyres are made from softer rubber when compared to road and mixed-use tyres. Though soft rubber offers better grip, it also means they wear quicker. Sports tyres are designed for hard riding, meaning that the peak operating temperature is higher than on road and mixed-use tyres. If you were to use a road tyre on a track, it would offer less grip and may run the risk of overheating. In order to have maximum surface area that is in contact with the ground, less tread is used. This results in less grip when riding in wet conditions, which makes sports tyres unsuitable for general road use. Sports tyres vary, from mixed sport and road use, all the way to dedicated dry race tyres that have very soft, sticky rubber and very little to totally slick. You’ll have likely seen these; the tyres that have studs rather than grooves. These tyres are excellent for riding on dirt, gravel, sand and any other loose surface you can think of. When it comes to riding on the road however, they don’t perform so great. Certain all-terrain tyres are actually prohibited for being used on public roads. In terms of tyres, you may have heard the term crossply and radial and wondered what is the difference between a crossply and radial tyre? This is essentially the construction process which differs for each tyre. Tyres comprise of many layers of rubber, cords, polyester, steel and other materials that aid in strength and durability. The strength of the tyre comes when all these materials are fused together. The layers in crossply tyres diagonally overlapped from the sidewall and over the crown (top of the tyre) and back down the sidewall. This essentially means the sidewalls are of the same material and construction as the crown. This means the sidewalls are very thick, rigid and firm, making for a hard ride. As the sidewalls and tyre crown are essentially a single component, it also means crossply tyres can get very hot under stress, resulting in the tyres expanding significantly at high speeds. 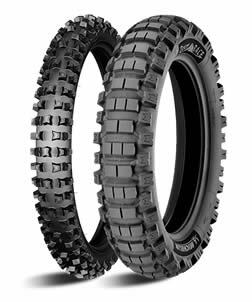 Due to crossply tyres having sturdy sidewalls, they are particularly suited to off-road riding as they resist impact well. Radial tyres on the other hand, the layers are arranged radially (in the direction of travel) and is separate from the tyre sidewall. Due to the crown construction and sidewall being separate from each other, the sidewalls are thinner resulting in much less heat when riding under harsh load. Other benefits of a radial tyre are flexibility whilst retaining strength. The flexible and thinner sidewalls means that radial tyres absorb much more impact allowing for a more comfortable ride. 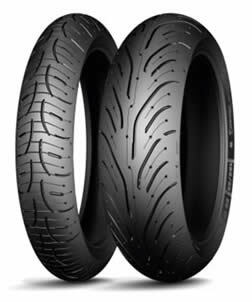 The reduction in heat on radial tyres also results in greater speed when compared to crossply tyres that are limited to 150 mph (240kmh). 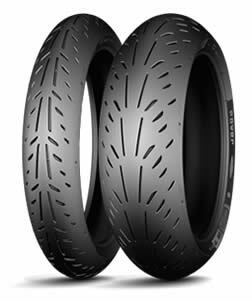 Some motorcycles may be fitted only with radial tyres.